Prove Them Wrong: The Kids Who Refused to Quit is a book about courage. 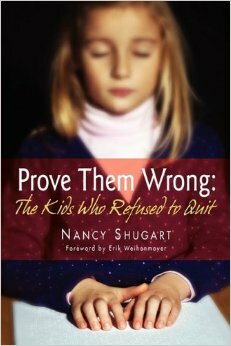 Author Nancy Shugart weaves together real-life stories with care and passion and proves that anything is possible when you believe in yourself!! But they chose to prove them wrong! How did they succeed? They will tell you! Unshakable evidence of what is possible for youth with disabilities! Essential keys to success revealed. In minutes, attitudes can be changed! From pre-school to college, learn how to set high expectations for your students with disabilities. Witness the endless possibilities available for your child who has a disability. Discover the untapped potential of employees with disabilities. Better understand your classmates who have a disability. Charge toward your dreams and join these winners!